Trends in cabinet style have evolved greatly in recent years—and thank goodness! The exuberantly carved, embellished look of the nineties is gone, and a more tailored and restrained effect has moved in. The most popular style at the moment is warm contemporary, a term that implies little carved detail, no patterns, flat doors, and a balanced composition of colors and shapes. Lately a new hybrid style has emerged— transitional design—a harmonious blend of the simple, modern lines of contemporary with the classic design elements of the traditional. Americans are seeing the wisdom and beauty in the sleeker contemporary look that has long been favored in Europe. This style can fit into any kind of home—if executed successfully. 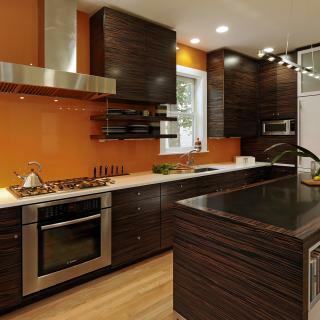 The use of flat wood cabinet doors, often in dark woods like walnut or wenge, can balance a contemporary aesthetic within a more traditional home. White, or lighter cabinets, can be added to the mix to brighten the look. 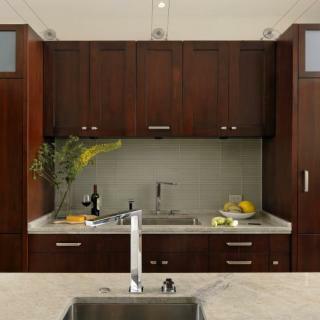 Wall cabinet doors that are wider than they are tall, such as 36” wide and 15” high, are all the rage. 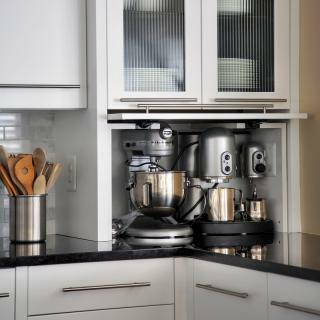 These cabinets can be installed singly, or for more storage, they can be stacked on top of each other. Since these doors cannot be hinged on the side for structural reasons, tilt-up hinges are used. These hinges have “stays” on them that allow the doors to stay in the “up” position. The best advantage, however, is that the doors can remain open while you’re preparing dinner, since the doors don’t get in the way of moving around in the space. Cabinet doors with tilt-up hinges can be solid wood, but often they are doors with aluminum frames, either thin or thick, with a glass insert. 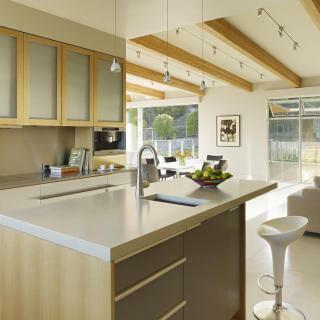 Since clear glass would reveal the large tilt-up hinges, and also because a view of what’s stored in the cabinets detracts from the simplicity of a contemporary look by adding visual clutter, frosted glass is typically used in this design. Innovative types of opaque glass are now available. Laminated glass is made by sandwiching a thin sheet of white polyvinyl between them two sheets of glass. This option is opaque enough to hide what’s stored in the cabinet while remaining translucent enough for interior lights to shine through. Another type of glass that’s new to the market is acid-etched mirrored glass. This glass is completely opaque and it has a green tint when viewed from one direction and a silvery tint when viewed from another. It adds interest without being distracting. There are also numerous types of “art” glass that may have wide or thin lines or ridges that can be used either vertically or horizontally, or they can have any number of patterns that are usually semi-opaque—similar to frosted glass. Another popular option for cabinet doors is installing them on tracks. 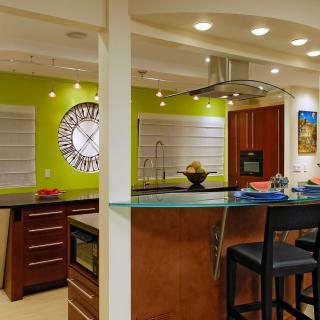 Sliding doors that bypass one another can stay open while you’re working in the kitchen. These doors are usually added on just one or two cabinets as an accent, perhaps under the cooktop or on the back of an island. Appliance garages hide toasters and mixers behind bi-fold doors that slide to either side on an upper track. Interior cabinet lighting is also popular, although it’s expensive. So it’s important to carefully select which cabinets to light. Though adding light to a pantry isn’t a new idea, the way that it’s lit is continually improving. The introduction of LED lights has been wonderful for this application, since they don’t emit heat and have a long lifespan. Drawers, pullout trash cans, and pullout spice storage racks are also good opportunities to use LED lights. cabinet doors that open and close with a remote control or the press of a button—and more innovations are sure to follow. Cabinetry options and technology are ever expanding, making it an exciting journey of discovery as you explore possibilities for your kitchen.